Woodcraft Miniatures lovingly Crafted with Your Own Hands! Talent with these Creative Ideas! Woodcraft Miniatures - In this category we find anything from balls, blocks, books, boxes, buckets, rolling pins, wheels, school bells, to food items, etc. With these techniques you can literally take your Plain Jane Craft Projects and turn them into stunning works of arts. Depending of course on how much effort you are willing to make. Generally speaking too, you can apply any technique for larger wood pieces to your minis. Like for instance, you'll be amazed at how easily a simple wood burning tool creates rich, intricate designs you can color with water-based paints, wax pencils, or gels. 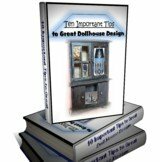 Think of what the technique of wood burning will do for your imaginative woodcraft miniatures you design for your dollhouse. Getting creative is easy when you first get excited about the projects you plan and then begin. If you don't begin most times you lose the momentum of your first initial excitement. It all begins with willing steps forward. Or all is lost. Gold leafing and crackle glazing designs with paint can both be done using special products sold in kits. All these creative ideas can be applied to any miniature within minutes. Working in mini takes no time at all. In fact most of your time will be spent in planning your next project. A few flicks of your brush on wood and you're done. This fact can not be overstated. It takes no time to paint a miniature and complete your project. After you get started in minis and find all the time savings you will indeed not want to return to full-sided items. Be sure to check out these awesome woodcraft miniatures available here.